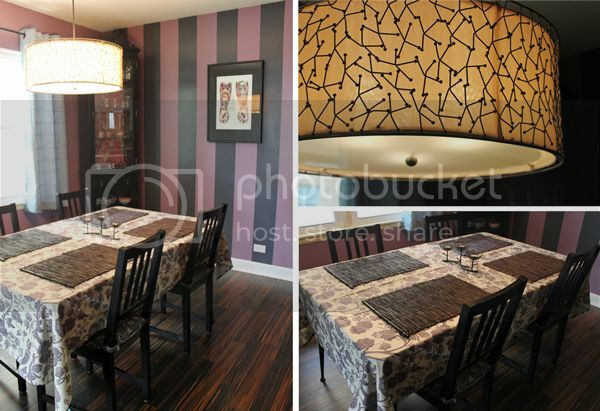 Last week, I randomly decided that the dining room needed a striped wall. The good news is that we have a ton of leftover paint from other paint projects, so I used the grey paint from our kitchen cabinets and went to town on the purple wall while Iggy was napping. Woo hoo! - Free home decorating project! I love making things look nice and not spending a penny. Doesn't happen often, but when it does, it feels great! When we moved into our house (it's been more than 2 years now), one of the first things we did was replace a lot of the light fixtures. I hated the dining room fixture, and we picked out this really pretty drum shade with a fun modern design. It reminded me of an Eames pattern, which appealed to my retro design leanings. I've combined some modern/retro/midcentury designs influence with other styles in this room, and I think the end result turned out pretty nice. We were given these placemats (they look like they're made of sticks) from our wedding registry (um, three years ago) and I finally got to use them now! I found a really nice purple patterned tablecloth at Target and it just seemed to look right. I think the overall theme in this room is shades of purple mixed with dark woods. And patterns. Lots of patterns. The wall, the curtains, the tablecloth, the china cabinet... all different patterns. But it all just seems to go together still. I looked around for a long time to find the right tablecloth. It seemed like most places had horrible color choices like maroon, navy, forest green, and beige. I'm all for the neutrals, but what about a gray even? Nope. So I was happy to finally find this one. Target also had some awesome bold graphic choices in mustard yellow or green also, so if you're in the market for a new tablecloth, I'd go look there now. I really love these plates (pictured above) that we turned into wall art. I couldn't bear to eat off of them and clean them and risk the designs fading or wearing away. So hanging them on the wall was a good solution. This china cabinet is a DIY project that took me a really long time to finish, not because it was hard, but because I kinda procrastinated and then life got in the way and I got busy, blah, blah, blah... but now it's done, and I'm sorry I waited so long! This cabinet was from Todd's great aunt, and it was originally brown with sagging shelves. We threw all of the shelves away almost immediately, and the cabinet used to sit, empty, except for a few plastic storage containers in the corner. Last summer I convinced Todd to take it apart and spray paint all of the wood black. So that was step one. Then I purchased some fancy wallpaper that I could never really afford to cover a whole wall but that I loved (I got mine here) and purchased just a roll. I glued it to the back wall of the cabinet. That was step two. The next step was to purchase some glass shelves, and wouldn't you know, we have a place right around the corner from our house! And it only cost around $30 to buy these three shelves with nice finished edges. We procrastinated because we thought it was going to be more expensive. Doh! The final step was to cut the wood shelves for the bottom and to paint them black. I also had to paint the wood strips we attached to the side walls of the upper cabinet to hold the glass shelves. But now it's all done and I love how it looks! Here's a close up of the wallpaper on the back of the cabinet. The pink design is slightly puffy and 3-dimensional from the silvery background. So, I hope you enjoyed my show-and-tell of the dining room. I hope to have some more house room tours in the near future. I also like seeing photos of other people's houses, so if you do a post on yours, please share! it looks awesome. how did you do it? i have always wondered how to paint a wall stripey and make it really straight. It's not nearly as hard as you might think! After doing two walls in our house, I feel more confident to do a DIY on it. Maybe soon? The trick is GOOD painter's tape, and to really affix it to the wall. I run a credit card over the tape to really seal it down before I roll any paint.